The fate of Jon Snow is being revealed on a need-to-know basis, and apparently the Game of Thrones bosses don't think Gwendoline Christie needs to know. Or so she wants us to think. As Christie told E! News' Will Marfuggi at the junket for her new film, a little movie you might've heard of called Star Wars: The Force Awakens, she hasn't even laid eyes on that season six teaser trailer that featured the possibly deceased Jon Snow (Kit Harington) front and center. "I've not seen any trailer," she said. "And I also only read my bits in the script, so I've got absolutely no idea what you're talking about ." Sure, whatever you say, Gwen. 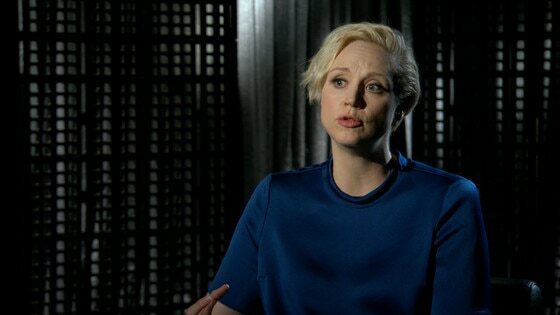 As for the fate of Brienne of Tarth, who we last saw swinging her sword at Stannis Baratheon (Stephen Dillane), the actress is equally, if not amusingly, tight-lipped. "I don't know. I haven't read it yet," she joked. "I mean, I've wrapped on it, but I didn't read any of it. I just improvised this year. The whole thing." Though Christie has clearly been put under a strict gag order about what's to come in Westeros in 2016, HBO has begun to tease the highly anticipated new season of the hit series. And by tease, we mean troll, because Jon Snow (who everyone wants us to think is dead as if we're new to this game) is the main focus of everything so far. First, there was the billboard in Times Square featuring our hero, bloodied and alive. Then came the teaser that forced us to relive Jon's brutal death (along with the rest of the misery that's been visited upon the characters in five seasons) all over again. What's next? We have no idea, but we're positive it'll play with our emotions some more. While we wait for HBO to troll us once more, press play on the video above to find out what Christie has to say about GoT's first season without a George R.R. Martin book to follow and sound off in the comments below!